The EUR/USD pair is still consolidating. Right now, the price is forming the ascending structure towards 1.1680, which may later be followed by the descending one to reach 1.1627. If later the instrument breaks this consolidation range to the downside, the market may fall to reach 1.1530; if to the upside – continue the correction towards 1.1722. 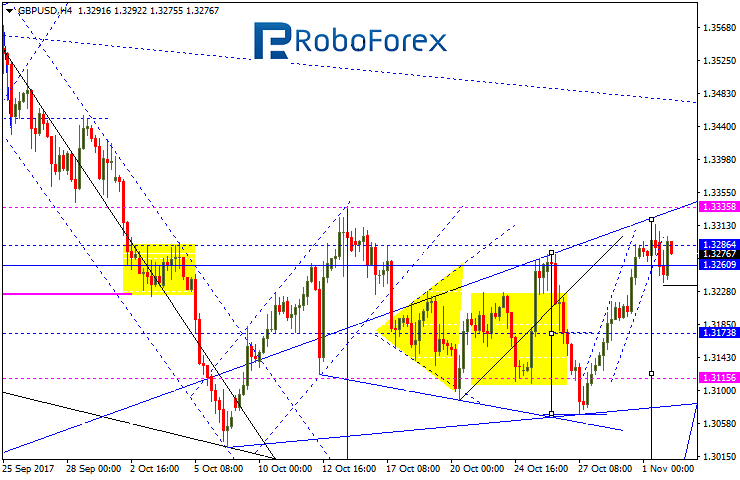 The GBP/USD pair is consolidating at the top of the ascending structure. If later the instrument breaks this consolidation channel to the downside, the market may continue falling to reach 1.2929; if to the upside – continue the correction towards 1.3440. 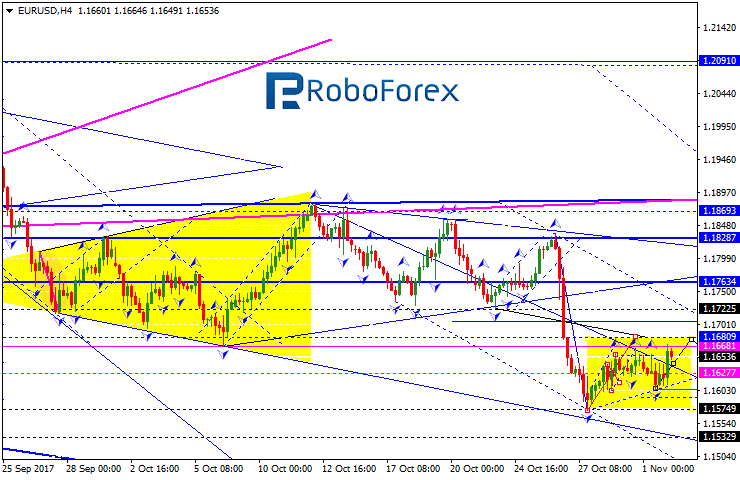 The USD/CHF pair is also consolidating at the top of the ascending wave. If later the instrument breaks this consolidation range to the upside, the market may grow to reach 1.0088; if to the downside – continue the correction towards 0.9886. The USD/JPY pair has formed the Expanding Triangle pattern and right now is consolidating in the middle of it. 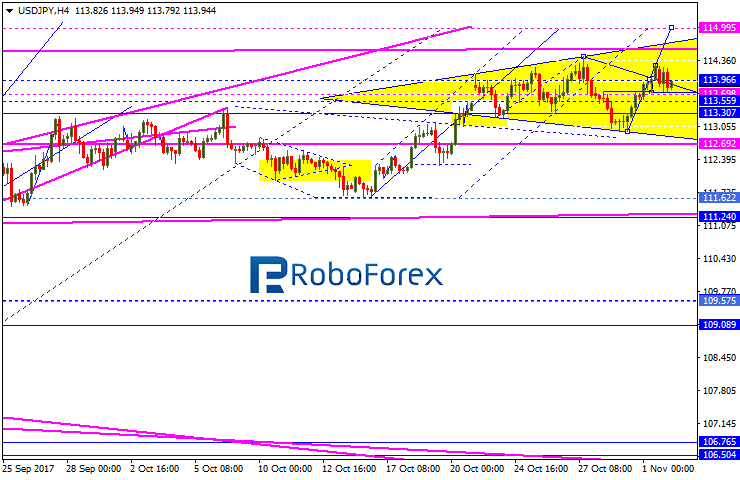 Possibly, today the price may continue growing to reach the pattern’s upside border at 114.45. Later, in our opinion, the market may fall towards 114.00 and then resume growing inside the uptrend with the target at 115.00. 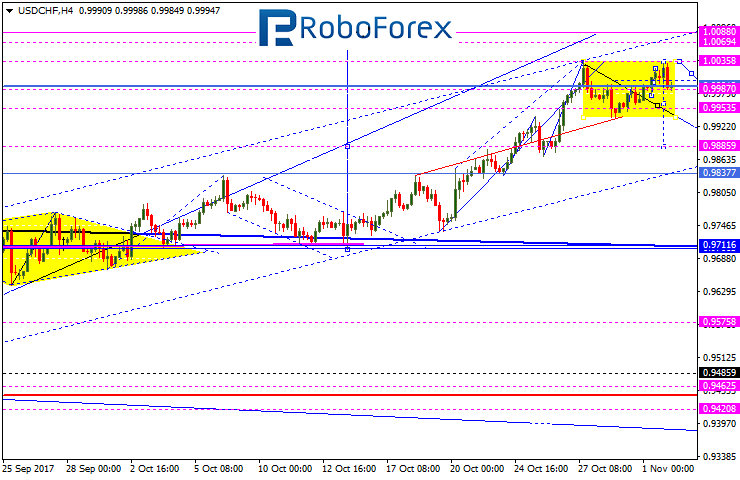 The AUD/USD pair is being corrected; it has already reached the target of the third correctional structure. 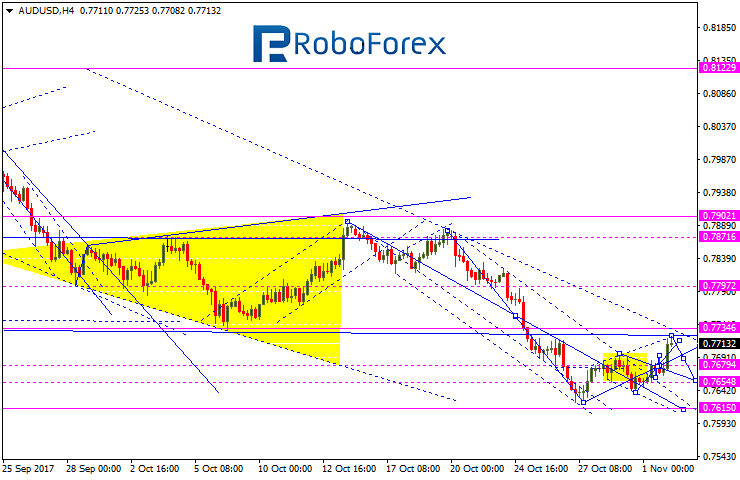 Possibly, today the price may fall towards 0.7676 (at least) and then grow to reach 0.7735. After that, the instrument may move downwards with the target at 0.7615. 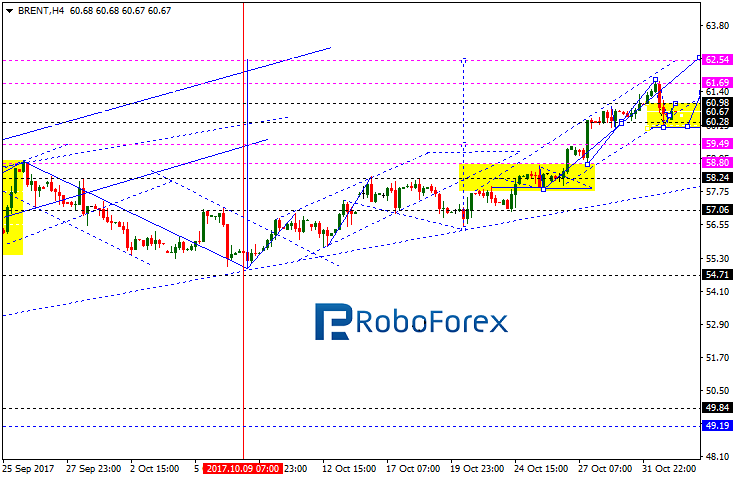 The USD/RUB pair is trading inside the ascending channel. 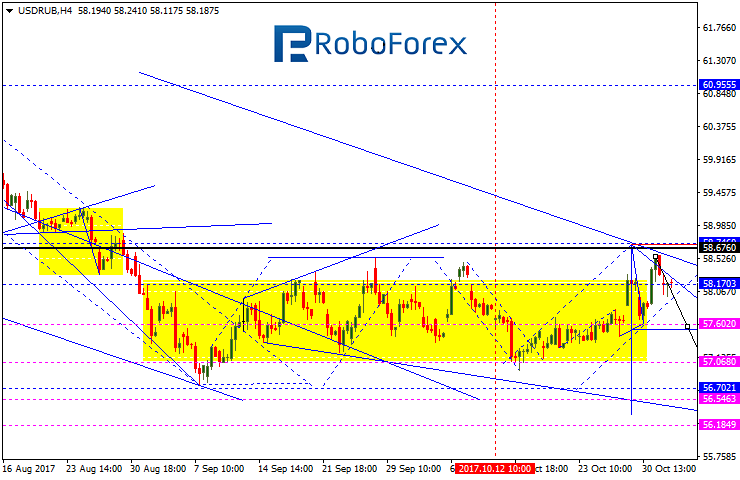 We think, today the price may fall to reach 57.60 and then start another consolidation range. Later, in our opinion, the market may break it to the downside and reach the local target at 56.60. 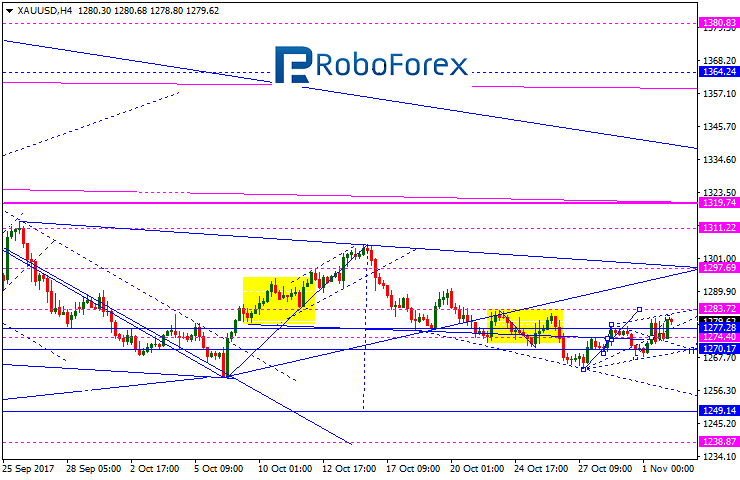 Gold is being corrected towards the target at 1284. Possibly, today the price may form the fourth correctional structure and reach 1270. Later, in our opinion, the market may form the fifth one to reach the above-mentioned target. After that, the instrument may continue falling with the target at 1250. Brent has finished the descending impulse towards 60.25 and right now is growing to reach 61.00, thus forming another consolidation range. If later the instrument breaks this range to the upside, the market may grow to reach 62.50; if to the downside – start another correction with the target at 58.50.